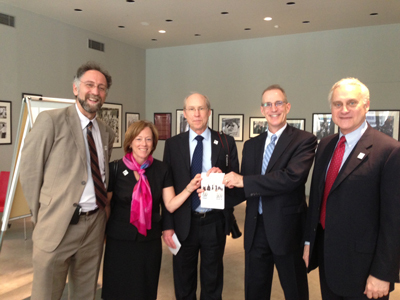 Public Affairs Officer Dr. Craig Dicker, Mrs. Jan Kilner, Consul General Scott Kilner, Dr. Curtis Sandberg, and Ambassador Francis Ricciardone at the exhibition in Borusan Music House. On April 27th, 2013, Meridian’s Senior Vice President for the Arts, Dr. Curtis Sandberg arrived in Istanbul to partake in the second annual UNESCO International Jazz Day festivities. Events leading up to the official Jazz Day on April 30th included workshops and seminars, panels and roundtable discussions, film screenings, student master classes led by prominent musicians and educators, as well as an abundance of concerts. Among these world-class events, Meridian’s photographic exhibition Jam Session: America’s Jazz Ambassadors Embrace the World was on display at the Borusan Music House in central Istanbul for the festival. The exhibition includes a collection of photos featuring 20th-century jazz greats, including Dizzy Gillespie, Benny Goodman, Louis Armstrong and Duke Ellington, who traveled abroad for the U.S. Department of State during the Cold War. The exhibition, which follows in the footsteps of the jazz musicians it celebrates, has traveled to nearly 80 venues in 37 countries since its inception in 2008. 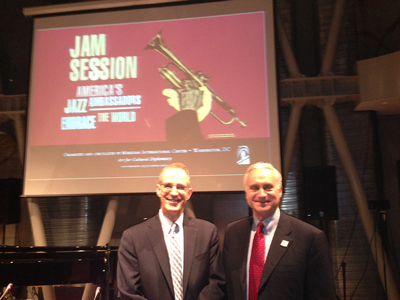 Dr. Curtis Sandberg provided two lectures and led VIP gallery tours over two days focusing on the role of American jazz diplomacy from the 1950s to 1970s. U.S. Ambassador to Turkey, Hon. Francis Ricciardone delivered the opening remarks. This September, Meridian and Turkey will come together again through an exchange with young jazz musicians from D.C. and Ankara. With support from the D.C. Commission on the Arts and Humanities, Meridian will bring a youth jazz ensemble from Turkey to Washington, D.C., to perform with local student musicians. The program will provide opportunities for the young Turkish participants to learn about jazz history through tours, performances, and meetings with music professionals and museum leaders throughout the city. This exchange embodies UNESCO’s founding principle for International Jazz Day, which explores the ways jazz has been an educational tool, as well as a vehicle for peace, unity, dialogue, and cooperation around the world.